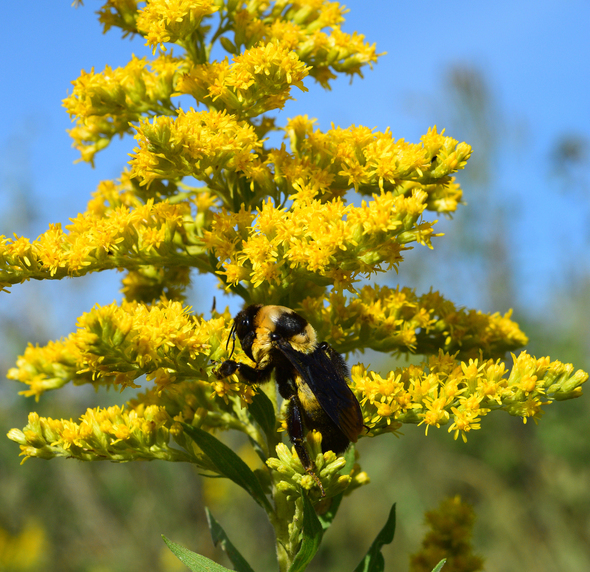 A bumblebee busily works over the flowers on Canada goldenrod at Badger Lake. The 1,100-acre public wildlife area along I-29 in northern Monona County is converting former crop fields to prairie to the benefit of grassland birds including pheasants and quail. Photo courtesy of the Iowa DNR. Whiting, Iowa – Sitting not quite halfway between Sioux City and Council Bluffs with I-29 going right through it, it’s easy to think that Badger Lake Wildlife Area would be overrun with bird watchers, duck hunters, kayakers and nature lovers 24/7/365. While it does get busy when the duck migration is on, many days the only visitor is a wayward cormorant or a neighbor stopping by to wet a line. This quiet but highly visible area is home to one of the lesser known historic campsites of Lewis and Clark’s Expedition and work is underway to transform much of the area back to grasslands like those the famous explorers encountered while searching for a direct water route to the Pacific Ocean. Doug Chafa, wildlife biologist for the Iowa Department of Natural Resources, is responsible for managing the 1,100 acres of timber, upland, prairie and wetlands that makes up Badger Lake. He has been working to re-establish diverse prairies where fields of brome grass had grown stale and where trees spread their influence over the grasslands. Chafa has converted three locations with a prairie plant mix to benefit monarchs and regal fritillaries butterflies, grassland birds and pheasants and quail. The conversion takes time and can be deceiving, even to the trained eye, but after doing it for 20 years, Chafa knows what to expect. “The first year, the plants put all their energy in root development so the fields look like a weedy mess. The second year the plants begin to focus upward and after we burn it in year three, the prairie just explodes,” he said. Walking through the first year prairie after the late summer mowing, the familiar pattern is evident. A little purple prairie clover is over here. A little golden rod is over there. This field is next to a plum patch that will provide excellent winter escape to the prairie wildlife. While much of the focus has been on prairies, part of the management plan includes maintaining 18 small food plots rotating from corn to soybeans and then idle to allow it to come up in annual weeds. The annual weeds attract bugs, produce a lot of seeds and provide cover for chicks. Only four of the fields will be idled at one time. Badger Lake is a linear series of wetlands connected by culverts under roads that provides opportunities for kayaking and fishing, but is best known for high quality duck hunting. Hunters come from Plymouth, Crawford, Pottawattamie, Monona and Woodbury counties, and from Nebraska. Chafa regularly gets calls from a Shelby County hunter when duck season is open. “He does everything he can to get his son out and his first call is over here for what’s going on at either Badger Lake or Tieville Bend,” he said. Want an inside tip? If it’s a migration day and the wind is strong enough out of the northwest, ducks will pile in to the marsh east of I-29 in the portion of the slough that turns from south to the west regardless of the number of hunters that are there. There is a 200-acre refuge on the north end west of I-29. Badger Lake is in a closed goose zone, meaning goose hunting is not allowed. There are three boat ramps on different segments to allow larger boats to access the wetlands. In response to hunter request, the boat ramp areas were deepened and gravel added to improve access. Purple gallinules, a secretive marsh bird, have been seen here. A few years ago a pair of young osprey started to build a nest structure but did not nest. The pair hasn’t been seen since. Bald eagles nested on the north shore in 2016 and 2017 but a wind storm knocked out the nest in 2017 and the eagles have not returned. Visitors need to be aware of their location to avoid trespassing on private land. The public land follows the lake closely and is along part of I-29. Crappie fishing here can be boom or bust, Chafa said. This past spring, it was boom. Badger Lake attracts photographers in the fall, and dog walkers and exercisers use the field lanes. “It’s pretty cool to get people out here experiencing nature,” he said.